Helo > Steam Generator AW28 With Simple Control & Outlet. (38m/3, 28kW). Helo steam generator AW28 with simple controller and chrome wall outlet (38m/3 maximum area). Simple one touch control (for those who prefer simplicity). Comfort Flo steam outlet included (chrome). A recess on top of the steam outlet can take oils for aromatherapy. Control with compact slim line design with clean, white fascia will surface mount neatly onto your tiled steam room wall with the minimum of fuss. Control can place your control inside or outside your steam shower. One to ten scales with bright red LEDs to indicate status. 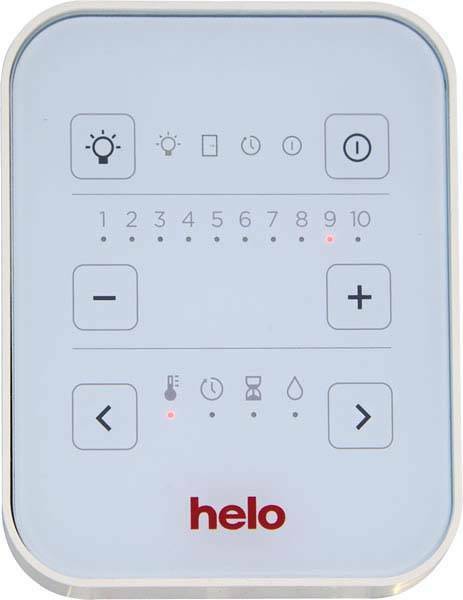 Control temperature, runtime, ON/OFF and shower light. Programmable so steam can be ready when you get back from work. Soft steam for a superior bathing environment. Stainless steel tank for a long life. Compact dimensions but fully serviceable with all components replaceable. Separate discrete temperature sensor so you can place your control inside or outside your steam shower. Size: 838W x 318D x 760H mm. Comfort Flo steam outlet and Control Bezel is also available in three different finishes (sold separately). Before deciding the size of generator you need, its important to know whether you have cold walls or warm walls. The way we work out which generator is correct for your enclosure is the w x d x h and we class a warm wall as being lined with at least a 20mm insulated tile backer board using ceramic or porcelain tiles and a standard glass door. If you walls are not lined and you use ceramic, porcelain, stone, marble etc and say a glass fascia then you will have to upgrade the KW size of the generator to suite. The steam room height should be around 2.1 - 2.2 meters to create the correct environment within a steam room (will not work properly with rooms over 2.4 high as all the steam will be up in the roof space rather than around you when seated). Fully tested and approved (safe and reliable). 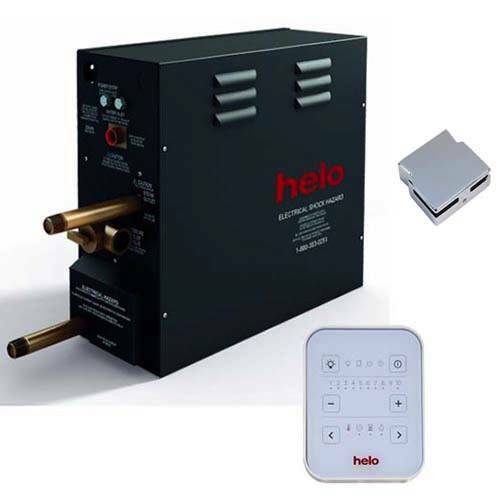 5 Year warranty: Helo give a 5 year warranty on this steam generator. Helo is the world's largest sauna and steam bath business. They develop, manufacture and market sauna and steam products worldwide. Helo Group Ltd has sauna room, sauna heater and steam generator manufacturing plants in Finland, Sweden, Germany and the United States and an extensive research and development program for sauna and steam related products. The group's range includes wood-burning and electric heaters and their controllers, steam generators, sauna and steam rooms, steam suites, infra-red cabins and various types of sauna and steam bathing accessories.